Our tour bus let us down along a convenient spot to hail a taxis to Zhong Yang street. We had been advised to check if the taxis accepted cash payment before boarding as some would only accept weChat payment. The first taxis we flagged down was exactly that, no cash payment accepted. Everytime we visited China we were so so amaze with its advancement. At this rate we were sure that soon physical cash would not be useful. 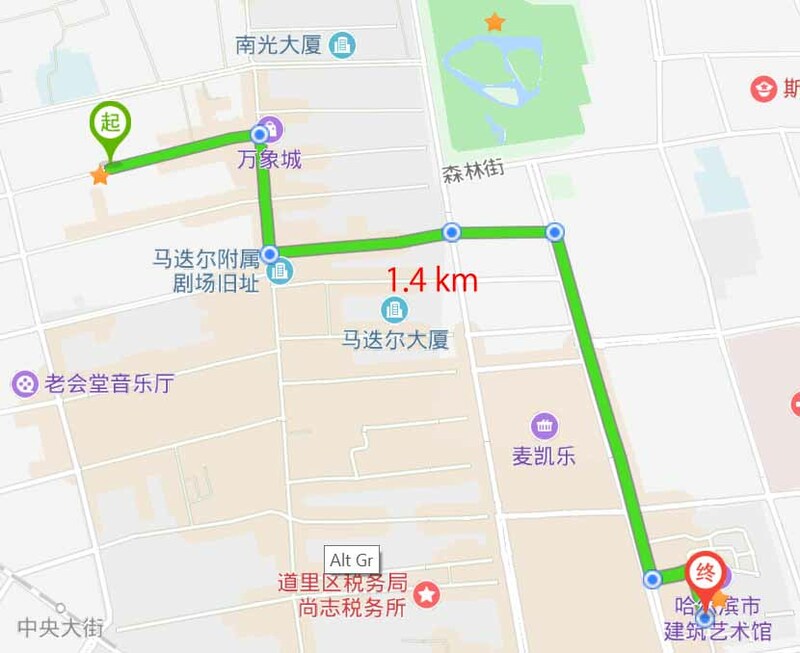 It was 5 kilometers taxis journey to our “stay” near Zhong Yang Street and the fare was ¥12 (base on taxis meter). 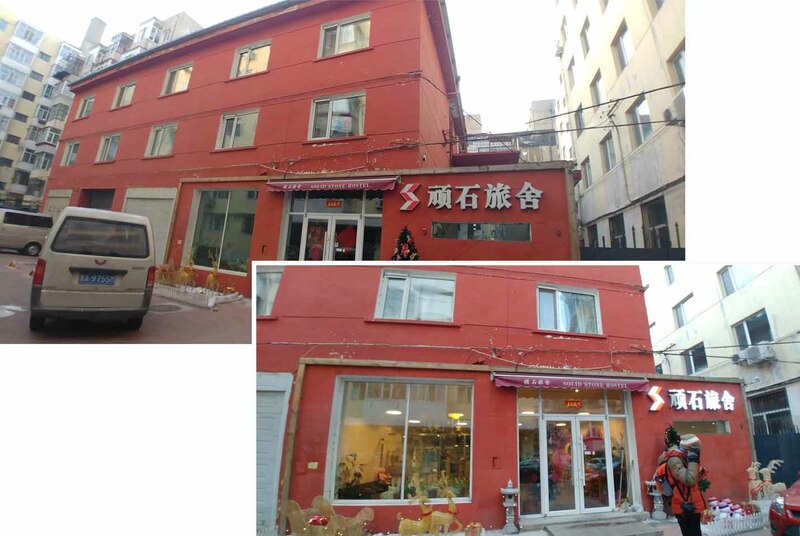 We had booked a three nights stay in a hotel on one of the many side alleys of ZhongYang street. This was decided after looking at the many Harbin hotels on the internet. 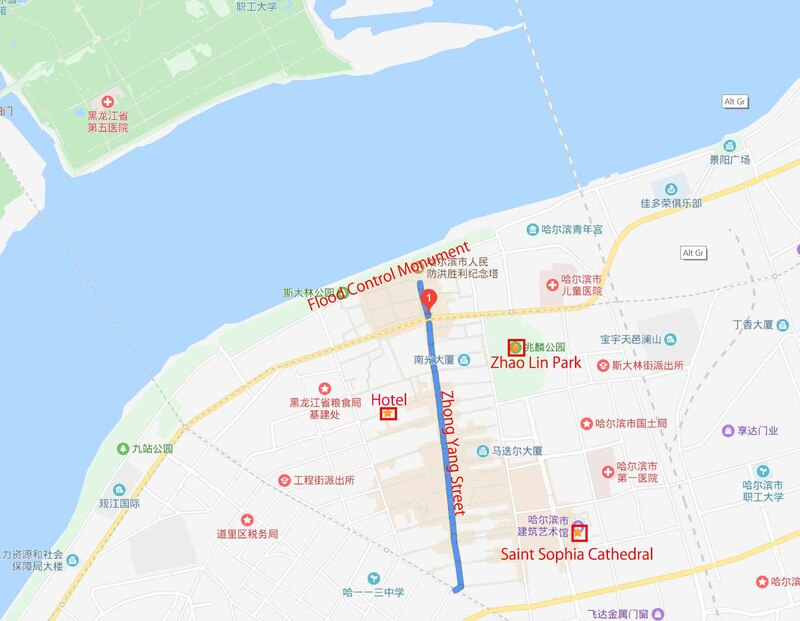 We picked a hotel near Zhong Yang street to allow us walking access to Zhong Yang Street and its various attractions nearby. 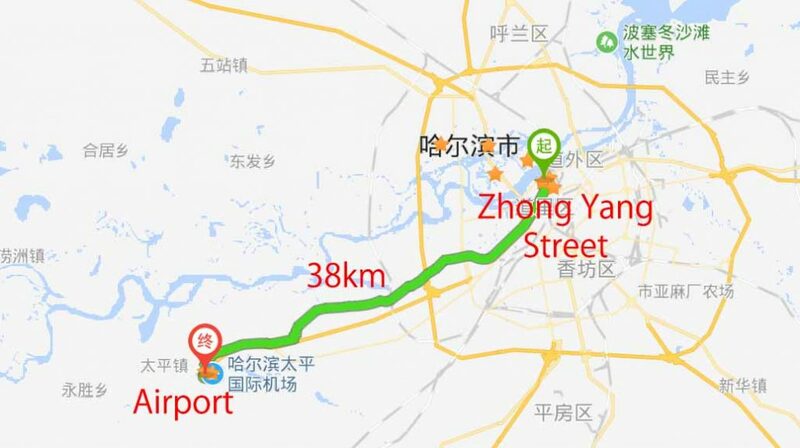 Our stay and Zhong Yang Street attractions. 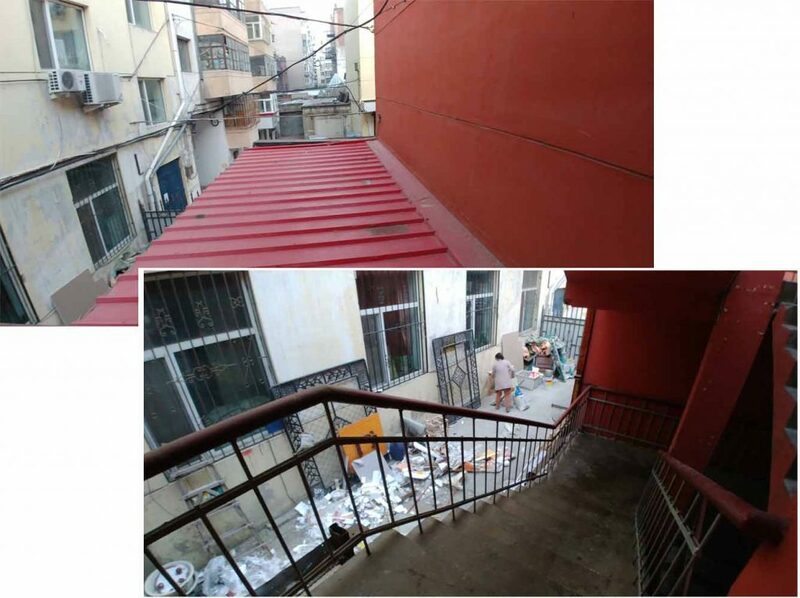 Though Zhong Yang Street was a pedestrian street, its side alleys were still accessible to vehicles. So we did not have to walk a long distance dragging our luggage to our stay. 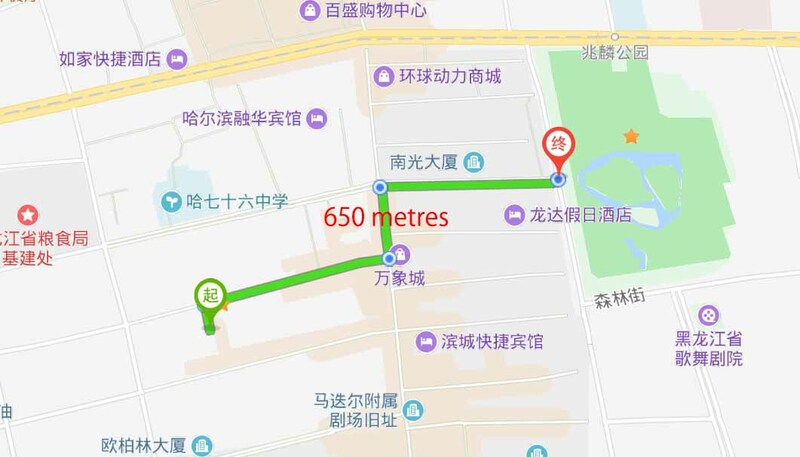 Our hotel “Solid Stone International Youth Hostel” (哈尔滨顽石国际青年旅舍) was only 250 metres to Zhong Yang Street which could be reached in less than 8 minutes of walking. “Solid Stone International Youth Hostel” front farcade did not face the alley so we took a bit of time to locate the hostel. It was one of the many buildings surrounding a huge square (rectangle). The square was accessed through a huge black metal gate facing the alley. It was not easy to notice the hotel sig board on the metal gate as there were many boards all over. On the ground floor of the hotel was a reception and a common sitting area. All the rooms were on the upper levels and to reach them and we had to walk up a external staircase at the side. Oh dear! the stairs overlooked the side yard of the hotel which were full of discarded construction materials. AWEFULL! Lucky they were not discarded food scrapes so there was no smell. Our twin room was no “Shangrila” but still seemed okay. It had an huge ensuite toilet with hot shower. The room had a flat TV and a kettle and a huge window! We booked the hotel from Trip.com which was an English equivalent of cTrip.com. The room cost was ¥300 a night with no breakfast. 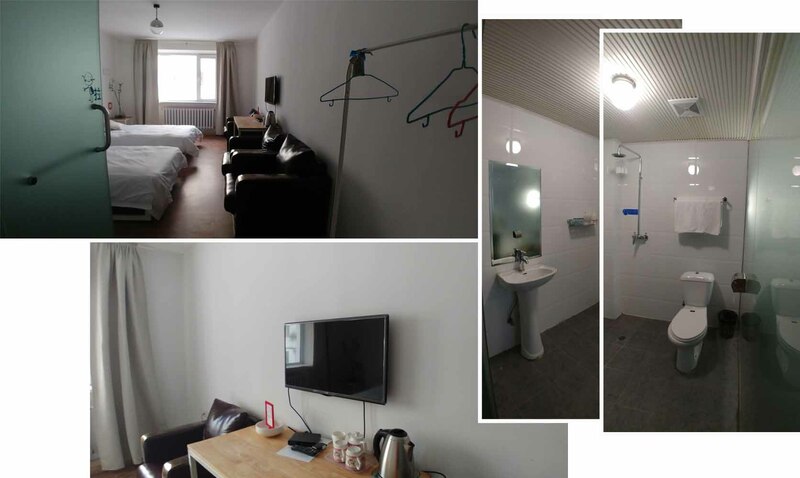 When booking the room we were very careful not to end up with a room that did not have a window, which was a common occurence in Harbin. Our room had a huge window that looked out into the square. Though there was no good view it was still better than a room with no window! On the first evening of our extended stay we walked for about 25 minutes in the freezing cold to reach Saint Sophia Cathedral before the sun set. 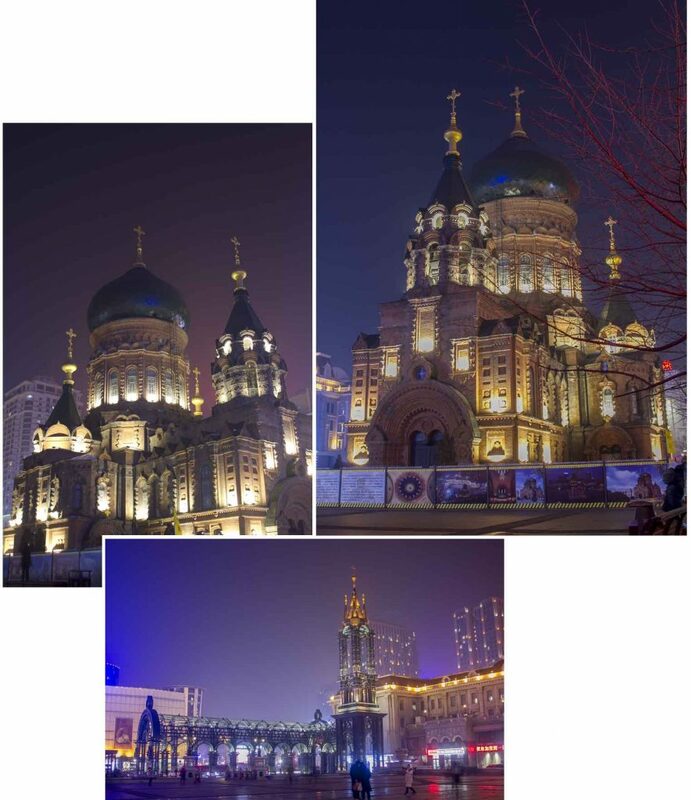 We had seen Saint Sophia Cathedral in the daylight and would like to view it in the night when it was brilliantly lighted up. We waited for the sun to set, the sky to darken and the lights to come on. Saint Sophia Cathedral was indeed beautiful. Though it was freezing cold at about -20°C we were not the only “crazy” people standing out in the open looking at the beautiful cathedral. ZhaoLin Park was about 650 metres from our hotel, we were not sure if we should visit it in the day or in the evening and what was the entrance fee be. We decided to visit it in the day to see the exhibits and if there were nice we would return for a evening visit. When we reached the park we were surprise that there was no entrance fee. It was a open park far all. 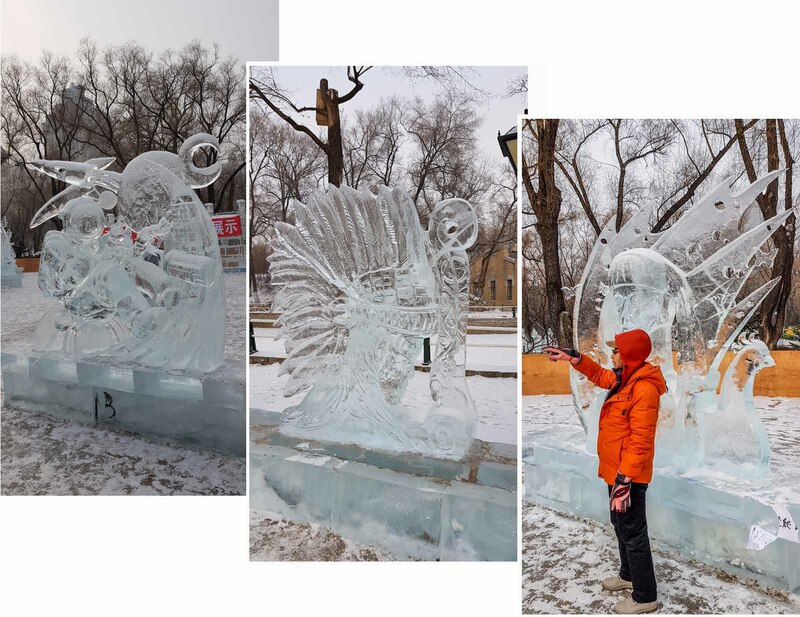 There were many ice sculptures all over the park. Some were very nice some were already melted and disfigured. We spent about 1.5 hours in the park walking from sculpture to sculpture trying to figure out what the sculptures represented. At the end of the visit we decided that the sculptures were not worth coming back for a second viewing in the night. Zhong Yang street was full of eateries. Every alternate shop was a restaurant. There were restaurants on the ground level, on the upper level and in the basement. 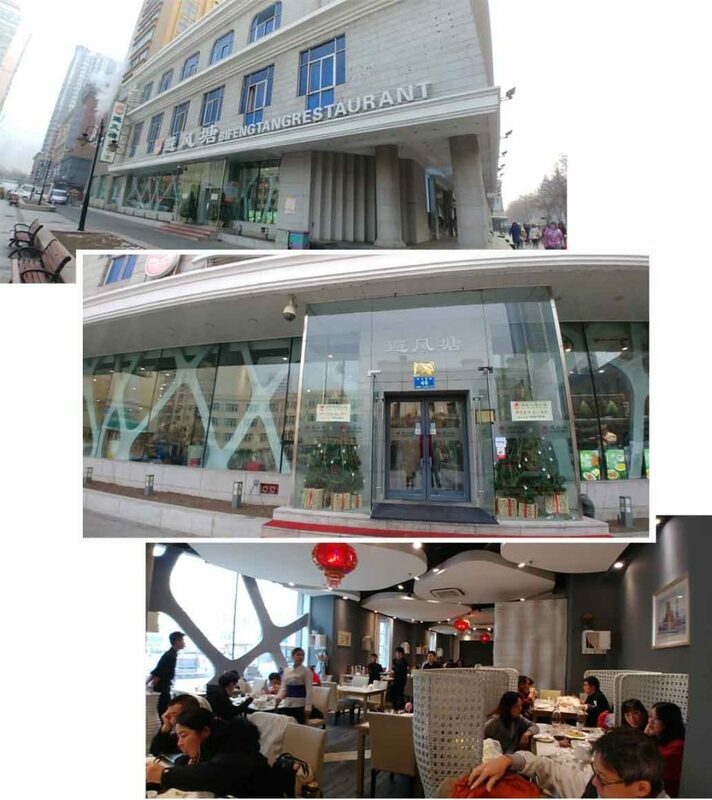 During our stay at Zhong Yang street we ate at a couple of places. One was a restaurant serving buffet dumpling meal and the other was a Hong Kong style restaurant. We did not like the buffet dumpling meal much. The dumplings were more dough than filling. The other accompanied dishes were also tasteless. The meal was rather inexpensive at ¥19 per person, with no limit to the amount of food to eat. 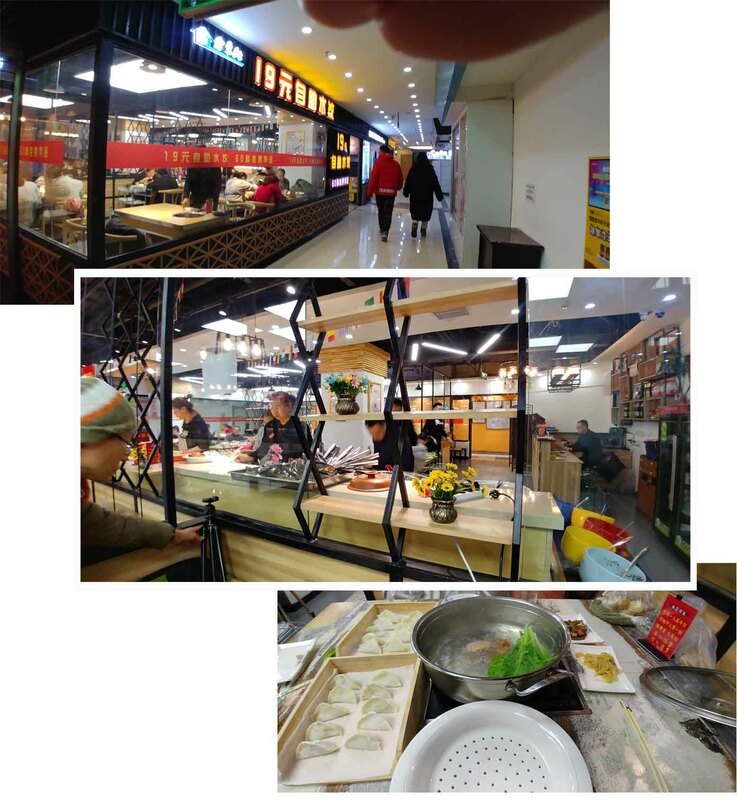 One of the restaurants near our hotel was “BiFeng” (避风) Restaurant. We liked the name as 避风 meant “avoid the wind” it sounded like a warm and nice place for a meal and we ate two lunches there. The restaurant was a “Hong Kong” style eatery. It served pork belly which was our favourite. We were down with a cold/flu for the last few days and whenever I was sick I yearned for hot porride. BiFeng restaurant did not served porride but it served black glutinuous porride top with coconut milk, yummy! 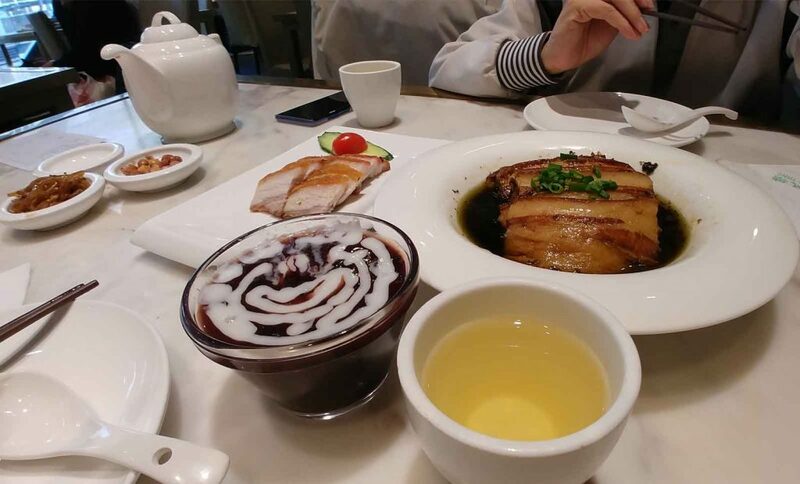 Our lunch at BiFeng Restaurant. Our three days extension in Harbin was not put to effective use because we both came down with a cold! Yat Thong caught the cold from me and I had no idea where I caught my cold from. We had hoped to pay a second visit to the “Ice and Snow World” and “International Ice and Snow Festival” as we did not have sufficient time to explore the two places during the first visit. Unfortunately being sick sapped our energy so we did not attempt the second visits. We slept in, woke up late, only ventured out for meals. We visited nearby attractions like Zhong Yang Street, Saint Sophia Cathedral and ZhaoLin Park. Another place we visited was a pharmacy down the alley. 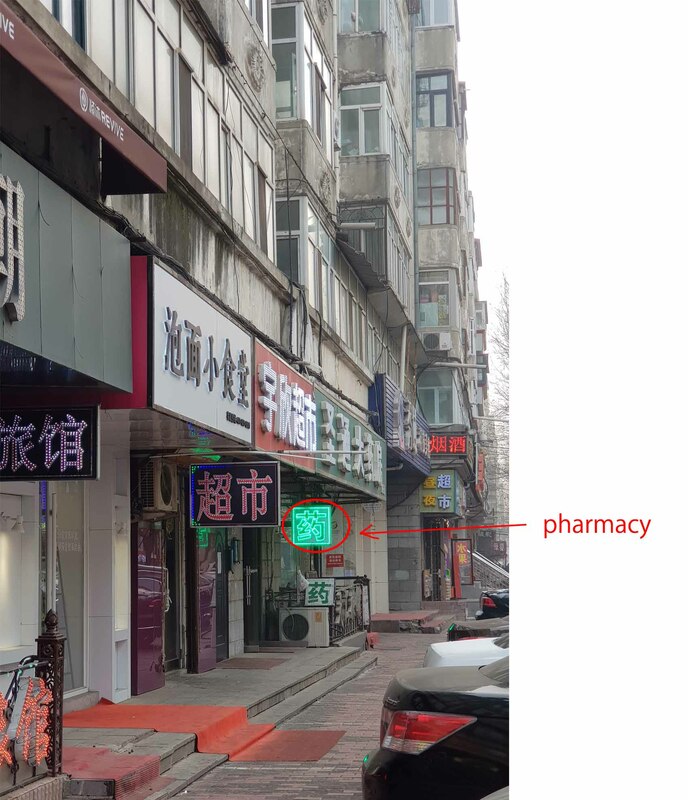 We walked into a Chinese Medical Pharmacy and explained to the two pharmists our symptons and were recommended a couple of medicines for running noses and sore throats. We kept our medical receipts safely as we intended to claim insurance when we reached home. Our hotel owner’s young daughter helped us hired a taxis to bring us to the airport. She whipped up a phone made a call and booked the taxis. She told us to pay her ¥120 cash as the taxis company would charge her through her account. While we were on the ride, the taxis driver told us that we would have to pay him for the toll charges which was not included hire fare. Oh no! We were very sure that ¥120 covered everything. We had previously confirmed with the hotel owner’s daughter that there would be no additional charges to be paid to the driver. We called the hotel and got the daughter to talk to the driver and then all was okay. Was the driver trying his luck to scam us? The flight home was Harbin to Beijing and then on to Singapore. 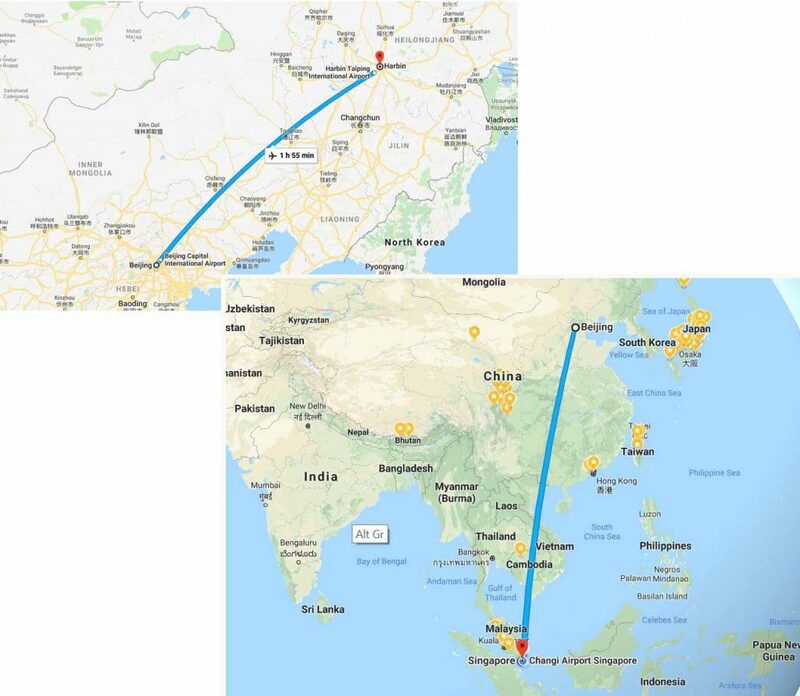 Unlike on the coming trip where we had to pick up our luggage at Beijing and checked them in for the flight between Beijing and Harbin, this time our luggage went straight to Singapore. Our transit time was only 2 hour which was not too long.